This is preview of Whitethorn 1B: The Village of Oester – “The Smuggling Ring” encounter from Openworld Press More information can found at the bottom of this preview. A band of pirates has moved into a few caves in a secluded part of the coast near the marsh. They not only raid ships off the Coast of Dreen, but also smuggle goods like ale and weapons between Calas and the barbarian city of Helleras to the north. A stockpile of goods is hidden in the back of one of these caves, while two of the other caves serve as sleeping quarters. The marsh dwellers know about these pirates and have started some limited barter trade with them. The smuggling ring does not think that the marsh dwellers will turn out to be a hassle and benefit from local supplies of food and water in exchange for a few barrels of ale. If the party finds out about this smuggling ring and the pirates know that they have been discovered by someone other than the marsh dwellers, the pirates do whatever they can to eliminate the PCs. If they fail to kill the PCs, the smugglers relocate to another location on the coast. The pirates are aware of the lizardfolk, but have not bothered to get involved with them. 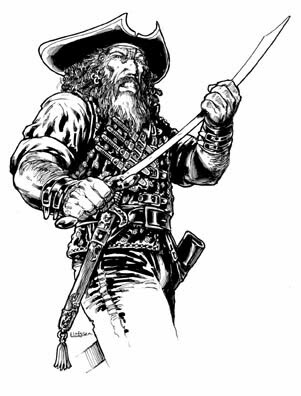 Glamorgin the Terrible is the leader of the pirates. His piercing eyes and fearsome appearance are enough to get even the bravest man’s knees knocking. Unbeknownst to many, however, he has quite the sense of humor and secretly gives some of his ill-begotten wealth to the less fortunate. That could be a reason why he has been sympathetic with the marsh dwellers whom he pities. Otherwise, Glamorgin the Terrible is cunning and ruthless. He shows no mercy to guards or nobles, unless they can fetch a good ransom. Glamorgin the Terrible – Male human Ftr8/Rog5: CR 13; Medium Humanoid; HD 8d10+5d6+30 (96 hp); Init +7 (+3 Dex, +4 feat); Spd 30 ft.; AC 19 (+3 8d10+5d6+Dex, +3 masterwork studded leather armor, +1 masterwork buckler, +2 Glamorgin’s Ring of the High Seas; touch 13, flat-footed 16; armor check penalty 0); BAB +11/+6/+1; Grapple +15/+10/+5; Atk +18/+13/+8 melee (1d6+6, crit. 16-20/x2, masterwork scimitar) or +16/+11/+6 melee (1d4+4, crit. 19-20/x2, masterwork dagger) or +18/+13/+8 ranged (1d10, crit. 19-20/x2, 120 ft., heavy crossbow); +Face/Reach 5 ft./5 ft.; SA +3d6 sneak attack; SQ trapfinding, evasion, trap sense +1, uncanny dodge; AL CE; SV Fort +10, Ref +9, Will +5; Str 19, Dex 16, Con 17, Int 14, Wis 10, Cha 13. Age 44; Height 5 ft. 10 in. ; Weight 185 lb. ; black hair & brown eyes; Reputation -100 (Vile). Skills (55+55): Appraise +7 (5), Balance +8 (3), Bluff +11 (8), Climb +10 (6), Diplomacy +5 (0), Disable Device +6 (3), Disguise +8 (5), Escape Artist +8 (5), Forgery +10 (6), Gather Information +1 (0), Hide +3 (0), Intimidate +17 (10), Jump +13 (5), Move Silently +3 (0), Open Lock +8 (5), Perform +5 (4), Search +5 (5), Sense Motive +7 (7), Sleight of Hand +8 (3), Swim +12 (6), Tumble +10 (5), Use Rope +8 (5). Feats (6+5): Athletic, Combat Reflexes, Deceitful, Dodge, Greater Weapon Focus (scimitar), Improved Critical (scimitar), Improved Initiative, Iron Will, Persuasive, Weapon Focus (scimitar), Weapon Specialization (scimitar). Possessions: masterwork scimitar, masterwork dagger, heavy crossbow, 5 bolts, masterwork studded leather armor, masterwork buckler, Glamorgin’s Ring of the High Seas, potion of greater invisibility (CL 8), potion of globe of invulnerability (CL 12), 15 pp, 27 gp, 16 sp, 5 cp. Pirates (15) – Male human Rog3: CR 3; Medium Humanoid; HD 3d6+6 (18 hp); Init +3 (+3 Dex); Spd 30 ft.; AC 17 (+3 Dex, +3 masterwork studded leather armor, +1 masterwork buckler; touch 13, flat-footed 14; armor check penalty 0); BAB +2; Grapple +4; Atk +5 melee (1d6+2, crit. 18-20/x2, scimitar) or +4 melee (1d4+2, crit. 19-20/x2, dagger) or +5 ranged (1d10, crit. 19-20/x2, 120 ft., heavy crossbow); Face/Reach 5 ft./5 ft.; SA +2d6 sneak attack; SQ trapfinding, evasion, trap sense +1; AL CE; SV Fort +3, Ref +6, Will +1; Str 15, Dex 16, Con 14, Int 10, Wis 11, Cha 9. Skills (52): Appraise +4 (4), Balance +9 (4), Bluff +4 (5), Climb +8 (4), Diplomacy +1 (0), Intimidate +6 (5), Jump +9 (5), Move Silently +6 (3), Search +5 (5), Sense Motive +2 (2), Sleight of Hand +7 (2), Swim +7 (3), Tumble ++10 (5), Use Rope +8 (5). Feats (3): Athletic, Dodge, Weapon Focus (scimitar). Possessions: scimitar, dagger, heavy crossbow, 5 bolts, masterwork studded leather armor, masterwork buckler, 1 pp, 8 gp, 9 sp, 7 cp. Names: Agreif, Bjarg, Borgen, Clegan, Deorn, Havril, Lalsthor, Milreif, Ranulf, Rastin, Seif, Stavan, Vagnar, Vnut, Wothar. Read GameWyrd’s review of Whitethorn 1B: The Village of Oester. Go shopping for Whitethorn 1B: The Village of Oester online.